Now that all the good women (Seth’s family line) are intermarrying with “those people” (Cain’s line), God also says his spirit will no longer dwell with man. Mankind will only live for 120 years from here on out. 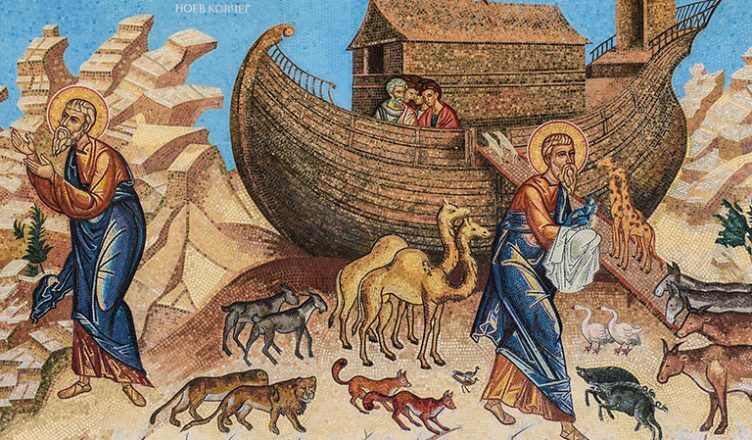 Except for Noah…and his kids…apparently, God’s spirit will slowly trickle off mankind, as the ages in Genesis slowly retreat as we go through it. We’ll get there. Some Christians believe God had to flood the Earth to kill the giants (which we have shown was a misunderstanding of the Bible), but clearly the Bible states it is the wickedness of man. Also, giants appear again much later in the book, so it wouldn’t have worked anyway. So omnipotent God decides that HE HAS MADE AN ERROR. He is so disappointed in how man turned out, he decides to kill ALL LIFE on the planet, not just mankind. God prepares an out though. He declares Noah, “perfect in his generations” and spares Noah and his family. (They were all direct descendants of Seth). Now, Christians will argue that this verse doesn’t actually mean what is clearly states! It can’t mean that god had regret, because other verses later say God cannot change his mind. Some argue that we cannot understand God’s thought process, and this word is as close as we can come. Others argue the word can also be translated as “comfort” and God is simply comforting himself by genocide. See, that’s much better. God says mankind (who is created in God’s image) is too violent, so he needs to kill them. In fact, he intends to kill every living creature on the Earth. He tells Noah to make an ark. Now, there’s a great deal of debate on size of a cubit, but going to Answers in Genesis website, they (obviously) say it was the most generous size, which is 20.6 inches. That gives us a ship 515 feet long, 86 feet wide, and 52 feet tall. With the three floors described, we have the floor space about 30% bigger than the average Walmart. And of every living thing of all flesh, two of every sort shalt thou bring into the ark, to keep them alive with thee; they shall be male and female. Of fowls after their kind, and of cattle after their kind, of every creeping thing of the earth after his kind, two of every sort shall come unto thee, to keep them alive. And take thou unto thee of all food that is eaten, and thou shalt gather it to thee; and it shall be for food for thee, and for them. In this ship, Noah and his family (eight people, assuming one wife per man), two of every land animal and bird, and food for everyone. Most Young Earth Creationists will tell you they didn’t need to eat to save space, or that it was “kinds” of animals (i.e. two “dogs”, not two of each breed), but the Bible clearly states two of each, and food for all. Noah begins his task. Genesis 7 starts by contradicting Genesis 6. 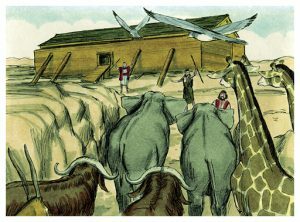 God tells Noah to bring every “clean beast” and all the fowls “by sevens” instead of pairs. Oh yeah, and you’ve got a week for this change. The heavens opened up, and the “fountain of the deep” opened up and the Earth flooded. It says the waters rose 25 feet above the mountains. I did the math. That would take an adding a volume of water that is approximately three times the total amount of water that is currently on earth. Okay. The rains stop, and the waters begin to recede. I will refer to Answers in Genesis for an interpretation of the jumbled mess of a timeline. Using the Sumerian 360 day a year calendar (who, by the way, don’t seem to have noticed this flood that occurred 2348 BCE), they say the ark came to rest on Mt. Ararat, but it takes another 74 days before you can see mountain tops. Hmmm. Then later Noah releases a several birds in sequence, and I had trouble understanding why. Here’s a link that explores this question. Essentially, the raven would circle until it found a mountain top with dead on it to eat. This would be a sign that mean eating animals can find dead to eat. (milestone one) The dove left and came back, because the dove couldn’t find vegetation. The second time, he returned with an olive branch, showing that there would be food for herbivores. (milestone two) This means plants survived the violence of the flood, and being submerged for months! The third time the dove never returned, as it now had access to twigs laying on the dry ground, and could make a nest. (milestone three). With this revelation, Noah opens the ark to discover dry land, but (for whatever reason) waits another 56 days to leave the ark. And Noah builded an altar unto the LORD; and took of every clean beast, and of every clean fowl, and offered burnt offerings on the altar. And the LORD smelled a sweet savour; and the LORD said in his heart, I will not again curse the ground any more for man’s sake; for the imagination of man’s heart is evil from his youth; neither will I again smite any more every thing living, as I have done. While the earth remaineth, seedtime and harvest, and cold and heat, and summer and winter, and day and night shall not cease. So, the first thing Noah does is start killing more animals. This final act of death seemed to quell God’s bloodlust. He says he will never wipe out all life again, admitting that man’s heart (who is created in God’s image) is evil anyway. This is after stating earlier that Noah is “perfect in his generations.” Odd that an omnipotent god would suddenly, after destroying a planet full of life, would realize it wasn’t going to do any good. Oopsie. Every moving thing that liveth shall be meat for you; even as the green herb have I given you all things. But flesh with the life thereof, which is the blood thereof, shall ye not eat. And surely your blood of your lives will I require; at the hand of every beast will I require it, and at the hand of man; at the hand of every man’s brother will I require the life of man. Whoso sheddeth man’s blood, by man shall his blood be shed: for in the image of God made he man. Weird, huh? So, Noah is told he can eat ALL animals and plants. 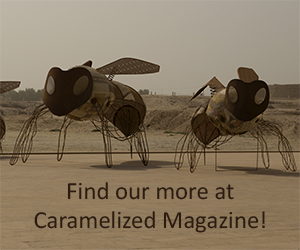 Poisonous frogs, belladonna, ringed octopus, and all the other things we know not to eat now. Also, on the table are psilocybin mushrooms, jimsonweed, and cannabis; take that conservative Christians! Later, God will radially change this rule, but that comes in Exodus. He does say to slaughter animals before harvesting them, which is interpreted by Jews as humanly treating cattle. Also, God reminds mankind not to kill another human, as it is punishable by death. (New rule, as Cain was just exiled). Just wait though, God abandons that rule pretty quickly and tells his people to commit genocide…we’ll get there. And Noah began to be an husbandman, and he planted a vineyard: And he drank of the wine, and was drunken; and he was uncovered within his tent. And Ham, the father of Canaan, saw the nakedness of his father, and told his two brethren without. Noah plants a vineyard and make wine. He gets drunk in the privacy of his own home and gets naked. Shem see it and tells his brothers, “Yo, pop’s drunk again.” His brothers walk backwards into the tent and cover their father. Noah then curses Shem (Was it for seeing him naked, telling his brothers, or not covering him? 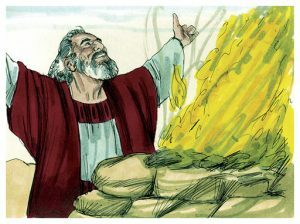 It is not clear) and his descendants (Canaan) while blessing the other two. This story captures two tropes of the old Testament: God’s blood lust and punishing everyone for one person’s sins. Again, and again children are punished for their father’s sin, and God uses terrible violence to punish his creation. Jacob gets a new name…and dies! Jacob – Reunited with Esau?